When I started my Etsy shop last March, I wanted to make la petite oye: all of the white cotton or linen accompaniments for respectable dress in the eighteenth and nineteenth century. I first started with sleeve ruffles - simple things, and not easy to find - and then I added two Regency chemisette options and then Victorian collars. Since I've been pretty well constantly employed since that point (hurrah! ), I haven't had the oomph to continue making items to sell and have mainly switched over to a commission-based system. Which also works better for me, since I have no home of my own and very little storage space to keep finished objects. 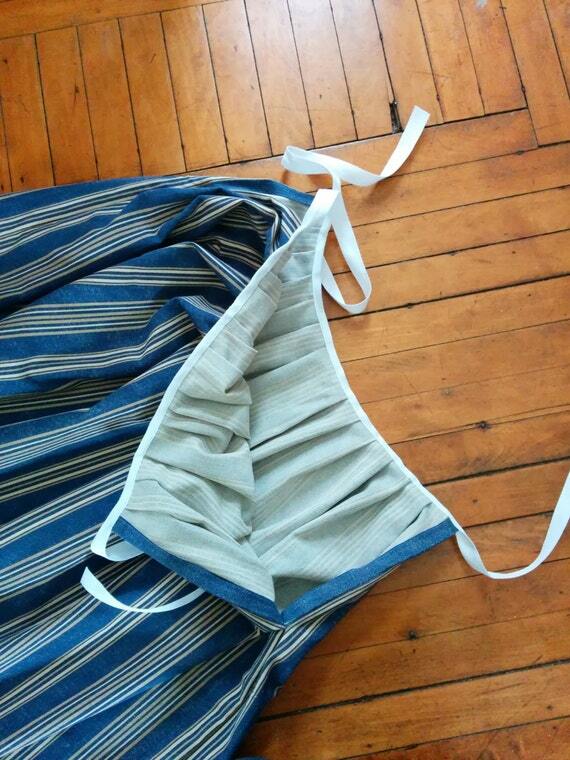 Although I did recently finish a striped petticoat. And I need to adjust my chemisette and frill patterns so that they hug the neck a little bit more. Is there something you can think of that I'm overlooking, or something I've thought of that you think should be prioritized? Shifts are ... under consideration. Would you consider making caps? I find them beastly to make, but you clearly have the skills. I love my chemisette and ruffles! I would like to! My patterns definitely need work, though. The only cap I've made is not great. But I just remembered that I translated a whole Garsault book and there's a section on caps. So maybe I will put down the kerchief I was hemming and cut out some mockup pieces to see if I can make something a little more solid. I'm so glad you love them! Thanks so much for your lovely feedback on Etsy. I adore my chemisette/ tucker thingy! I sincerely hope I can give it a little more public exposure in the coming months. I second KittyCalash on the caps. I have made two of my own, and they are passable, but I didn't enjoy it. Your work is lovely! I'm glad you love it! I want to make things people love. I worked at a basic cap today and the caul/back area turned out to be several inches too small, grr. But over this week or next weekend I should be able to try out a bigger one. The main problem is that I really, really prefer working from primary sources, and there seem to be incredibly few when it comes to caps. And the most crucial part, the bottom of the back, of course appears in very few paintings.